Assateague Island – Chesapeake Chapter U.S.L.H.S. 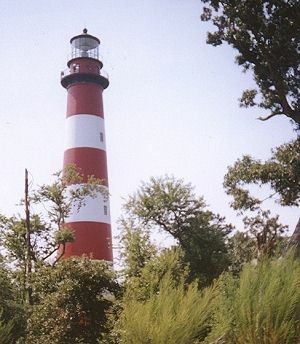 In 1867, a new lighthouse was built on a land bluff that was thrity-one feet above mean low water and positioned on the southerly part of Assateague Island. The lighthouse replced the original lighthouse whose tower’s height proved not tall enough to aid in navigation. The distance of the tower from the nearest high water mark is about thirteen hundred feet. The keeper’s quarters was built in 1867 and consisted of three large sections, large enough to house three families regardless of the size of each family. Each section included a pantry, kitchen, dining room, living room, three bedrooms, bathroom, and large closet; porches were on both sides of the house. The 142′ tower is located within the Chincoteague National Wildlife Refuge just east of the town of Chincoteague, VA.
For operating hours and admission prices, as well as other information, go to the Assateague Lighthouse website or call 757-336-2872. Children age 2-12 must be accompanied by adult. All proceeds will help fund the restoration, preservation and operation of the lighthouse. DIRECTIONS:From Washington D.C.: Chincoteague, V.A. is about a 3 hour drive. Take U.S. 50 East across the Bay Bridge and south to Salisbury, M.D., pick up U.S. 13 South and then Route 175 east to Chincoteague Island. When you get to Chincoteague Island, go straight on Maddox Blvd. to Assateague Island. From V.A. Beach: From the Bay Bridge Tunnel, stay on U.S. 13 North: then turn right on Route 175 East. When you get to Chincoteague Island, go straight on Maddox Blvd. to Assateague Island.